What is stopping you from selecting all tracks of the album and manually tagging them with an album rating? It's something I used to do in customdb before that component made foobar totally unusable. I still use it like that for artist and genre rating, plus a few other calculated fields related to genre and artist, but indeed customdb makes foobar2000 a lot slower and it's been abandoned by the developer since years (tip: version 9a is not as buggy as the latest one). Anyway, I totally second your request, but it's not just about album rating (maybe this will answer @jazzthieve's question, too). Even though customdb's main purpose was saving tags without writing them into the files, I believe its real benefit is in providing them as calculated fields, that is fields whose value is not entered directly by the user, but derived by other fields. This enables the user to organize tags in one-to-many relationships and grant referential integrity to the metadatabase. I detailed the matter here, when I first started using foobar2000, before I found out about customdb (which BTW is the main reason I decided to stick with foobar2000). I've seen several attempts to replace customdb's external tagging functionality, but none really seems to care about calculated fields. On the other hand I've seen quite a few other components that provide apparently calculated fields for specific purposes, such as the playcount fields as provided by the official playcount component or by Jscript and Spider Monkey panels. I'm not sure why nobody ever attempted to replace such a unique and useful plug-in as customdb, but I got the idea that most people see customdb as an external tags component, whereas concentrating on the calculated fields only, would be pretty simple, as this seems to be already implemented in the components I mentioned above, despite not being customizable by the user. But I'm no developer, so this is just a guess. One of the big problems was the sluggishness customdb caused. It also kept crashing album list panel in later versions of columns when appending the rating to the album tree. I might try 9a in a portable test version this weekend though. That component is too useful for storing information. Nothing. I prefer not to do that for various reason some of which @davideleo stated. And blah blah blah... the point is the less I'm changing the actual music files themselves, the better off I'm going to be in the long run. And finally, I just hate superfluous tags. I find them annoying. You don't need a bunch of nonessential information in the metadata. That's what databases are for. EDIT: I've also considered mtags but I found it just leaves too much junk for my liking. Nothing against the component. It's just a personal preference on how I like to keep my music library. especially for frequent Beta Updates. I think pushing beta updates automatically isn't a great idea at all. Beta is for testing purposes and for those wanting to do that specifically. Doing background updates on betas goes completely against that idea. It's a different thing for final releases. Any automatic updating should be an option, but especially when it comes to beta versions. That said, if automatic updating were an option, the setting in Advanced Preferences > Updates to check for betas when running a stable version could have a sub-option for automatic beta installs. An option showing the remaining play time (countdown) for the playlist. Maybe put it on the status bar in the menu that says "Show Total Time of Selection"
Would it be possible to add FFMPEGs default AAC encoder for ripping into AAC? Or maybe general support for FFMPEG encoding, like this I would only need one file. IMHO that's unlikely, because foobar2000 doesn't really support bitstreaming. I'd like to see this too, more customisation options would be great. I know that of present day Foobar2000 does not support bitstreaming and dresses DSD files as DoP. Or simply converts them to PCM. But is there any reason in principle why it should not bitstream in future? I really do not know, I am not a software guru, neither an engineer in audio electronics, so I have no idea why for instance JRiver can bitstream and Foobar should not do it. Its only a minor bugbear, but a lot of the time, when listening to albums, I usually think of something I'd like to listen to after this current track has finished playing, so I "send to new playlist" the new album, which then autoplays and the current track stops. I wish there was an option so that you could continue listening to the current track while adding new playlists. There is. Untick "Start playback when sending selection to playlist" under Preferences -> Media Library -> Album List. Thank you! I thought there must be, but googling proved not very fruitful! Autocomplete for tag entry with multiple columns visible at the same time, when several lines in Properties are selected and Edit chosen from the context menu (for example, related fields, composer, lyricist and producer). And of course autocomplete after semicolon, requested before. This function is well hidden! I thought I needed another tag program or multiple columns in the playlist to get that view. Better adjusted built-in spectrum analyzer, which uses the full range of the display for a typical musical signal (approximated by pink noise) at ReplayGain level. Currently the analyzer has much empty space, particularly in the treble region even on bright records, and shows nothing for quiet segments, esp. on the toolbar where it is constrained to a small size. A good example is a Third-Octave Analyzer, which reads flat for pink noise, and has good frequency resolution in the bass and good time resolution in the highs, smooth minimum-phase response, but it costs much CPU with large number of bands. In Foobar, the bands setting appears to be fixed and only changes the GUI rendering. Maybe link the floor and ceiling to ReplayGain and its preamp setting, and add a 3dB/octave slope for frequencies above 500Hz, or add a separate preamp setting for case where the DSP changes the level. Small frequency scale marks would be welcome and an extension in the deep bass. 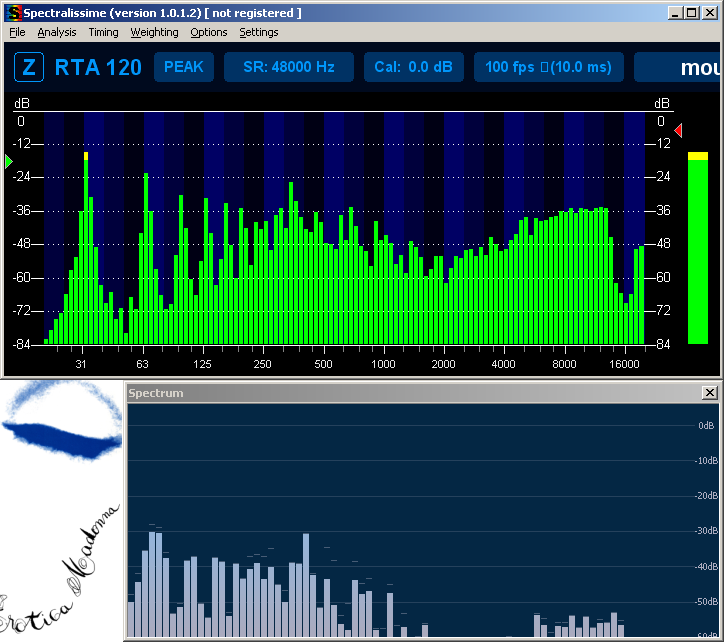 Other requests relating to the spectrum analyzer: lower bass, gain, slope. 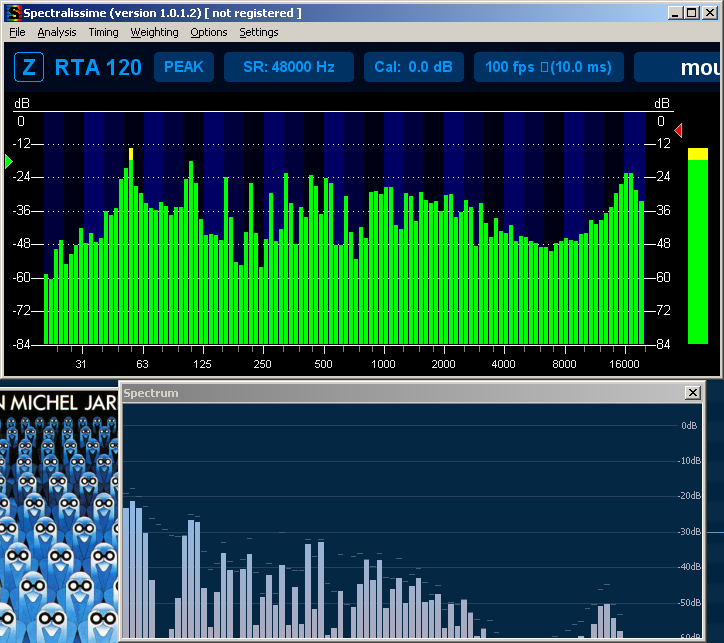 Same moment on Toolbar analyzer with 3dB slope. FFT set to 8192, but still has poor frequency resolution in the bass or no movement. Option to not show confirmation dialog when deleting files with Shift+Delete. Foobar has the be one of the worst apps I used when it comes to data security. If there's a hitch, the theme file gets corrupted immediately, and I lose every single playlists (or maybe only all their titles). Configuration also regularly gets corrupted. Right now I lost all playlists, every single on. And of course neither auto-backup, nor my scheduled backups have them because Foobar morbidly keeps changing the playlists folder on updates, without a note. So neither the auto-backup, nor mine were prepared to this. The playlist folder was changed once and you can use wildcards to most likely capture any other changes, assuming there will be any. What I do agree on is that the component page could use an update to warn users that the default settings might not be sufficient and offer a saner value that captures the 1.4 playlist folder. Also the foobar changelog should indeed mention that the playlists are now saved in a different folder.